NORTHAMPTON — Over the last decade, middle and high school students have been smoking cigarettes less — rates have dropped significantly since 2011. The bad news is that a new vice is on the rise with young people: Juuling. If you don’t know what that is, you’re not alone. Juul is a brand of e-cigarette that vaporizes a liquid containing nicotine. It looks more like a thumb drive than a cigarette, doesn’t create a lot of vapor and is more likely to smell fruity than smoky, making it easy to conceal — even in a school. Juuling is also known as vaping. “I know a lot of kids who Juul, almost half the kids I know,” said Bryden Ventola, a Northampton High School freshman who said he doesn’t Juul. Max Shannon, a teenager from Amherst, estimates the number of high school-aged youth Juuling at around 50 percent. 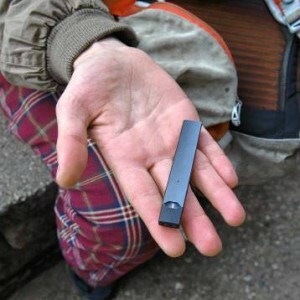 “I don’t know many people who don’t have a Juul,” he said. Shannon and his two friends, Northampton High School students Jestina Jones and Lucia Lomax, all say that people their age are addicted to Juuling, though none of them said they do it. “I would say it’s an epidemic,” Shannon added. Statistics from a bi-annual survey of thousands of students were discussed Friday at a presentation mostly to educators in area schools, as part of a vaping prevention workshop in Northampton sponsored by the Collaborative for Educational Services and the Strategic Planning Initiative for Families and Youth. The survey found that 45 percent of 952 participating 12th-graders in Hampshire County said they had tried an electronic cigarette at least once. Just over 21 percent said they had used it in the last 30 days.